Apologies for not publishing the Stoke match report yesterday. I spent a large chunk of yesterday with i.am.OGB and the Cousins of Ciroc popping a thing or two and having a blast at Elegushi Private Beach. The night was quite young so I, my cousin El Nnanna and his crew went to Caliente to have a swell time but it was accompanied by a long hangover afterwards. Despite all these shenanigans, I took some time out to watch the replay of the Arsenal – Stoke game knowing fully that it ended in a draw. However, I took solace with the fact that the consistently inconsistent Wigan tore the Premier League script to smash four past Newcastle. While the ball for third place still remains in Arsenal’s court, there’s a new twist in the tail of the final coveted Champions League spot. Kyle Walker got on the score sheet against Blackburn and people went haywire on Twitter, saying that he has justified his PFA Young Player of the Year award with the goal. As this tweet rightly puts it, rating him above Sergio Aguero is the philosophy of a fool. Tottenham’s victory over Blackburn propelled them back to fourth place and a victory in their game in hand will still put them where they’ll forever be – in Arsenal’s shadow. Elsewhere, there was another miracle witnessed in Stamford Bridge. It’s certainly not as significant as the parting of the Red Sea or turning water into wine, but the fact that Fernando Torres actually scored a hat-trick is as surprising as Gareth Bale declaring openly that he’s not a chimp. Chelsea’s 6-1 thrashing of Queens Park Rangers also put them in contention for the final Champions League slot and they’ll have a real battle on their hands to end the season in that position. Arsenal visited the Britannia to play a Stoke side that is renowned for their aerial style of play that works for them week in week out. This was the ground Aaron Ramsey suffered a leg fracture two years ago but scares emerged when Dean Whitehead had a rough lounge at Alex Song but the midfielder came out unscathed. Despite being a defensive midfielder that’s meant to break up play and make challenges, Song has been on the end of some nasty tackles this season. A few weeks ago, Mario Balotelli almost snapped his leg like a twig. It’s heartwarming to know that there won’t be any African football tournament this summer, so Song can relax with his family, recharge his batteries then get ready for Arsenal’s pre-season adventure this summer. Stoke scored the match opener in typical fashion, but it was after some complacency from the usually reliable Bacary Sagna. Matty Etherington swung in a cross that was duly dispatched by the beanpole, Peter Crouch, after out-jumping Thomas Vermaelen, leaving Wojciech Szczesny rooted to the spot. Arsenal pegged Stoke back when some good intricate passing play between the Rabbi, Yossi Benayoun and the 29-year-old Tomas Rosicky. The Czech dynamo lofted a brilliant ball that was smashed home by Robin van Persie. The Flying Dutchman’s goalscoring well has began to dry up in recent weeks but the effort was worth its weight in gold. It was the Arsenal’s equalizer that ended up being the goal that ensured that the Gunners would go back to London with a share of the spoils. It also gave van Persie some breathing space for the Premier League Golden Boot, as Manchester United’s Shrek is closing down on him. After an exciting first 15 minutes, the game plummeted into mediocrity as Arsenal lacked that edge in the final third. There were a few saved shots and appeals for penalties but clear cut chances were few and far between. Arsene Wenger’s post-match interview was centered around his team’s battling qualities. Without further ado, here are three key lessons I learned from the Battle of Britannia. Arsenal actually needed all three points at the Britannia to solidify their status at the third best team in the land but I’ll rate this draw as one vital point gained rather than two points lost. With two games against Norwich and West Brom left to play, Arsenal is sitting pretty at third place with 66 points while the other contenders for Champions League places can’t go level on points with the Gunners even if they win their games in hand. Newcastle has been riding on a high recently but the shocking loss to Wigan Athletic has brought them down to Earth. With daunting fixtures against Chelsea and Manchester City still around the corner, talks about the Magpies playing in the Champions League should be rightly gone with the wind. Tottenham added to Blackburn’s woes with a 2-0 victory and they still have more relegation candidates to face off in their bid to play Champions League football next season. They have the easiest set of fixtures on paper and they are hugely tipped to secure the last slot. Tomas Rosicky joined Arsenal in the summer of the 2006 World Cup in Germany and he is renowned for his amazing ability to orchestrate the midfield with his passing, sleek movement and gifted technique that earned him the nickname “Little Mozart”. In six years at Arsenal, he has only managed 115 league games and he has spent a large chunk of his Arsenal career on the sidelines with niggling injuries ranging from his groin to his knees and ankles. He scored his first goal since the Feudal Age last season when Arsenal played Leyton Orient in the FA Cup but he has been on the score sheet recently with well-taken goals against Tottenham and AC Milan. The rise to glory of promising youngsters like Aaron Ramsey and Jack Wilshere has limited the Czech’s chances of playing week in week out but Wilshere’s long-term injury and Ramsey’s poor form have paved the way for Little Mozart to get a run-out and re-discover his form. Rosicky has been a phenom in recent weeks, and his form earned him a new contract extension. Rosicky recently stated that he’s 29 years old, because he spent the best part of two years nursing his infamous hamstring injury. To be frank, he has been playing like a 29-year-old in his prime and Arsenal has benefited greatly from his new lease of life. To think that Emmanuel Petit wanted him out of the club at some point this season. In the Stoke match preview written by Dammy J on WaZoBia Gooners, Robin van Persie was referred to as “RVP PFA FWA – Our Pride”. The Dutch forward has been the brightest spark in a somewhat “dark” season for the Gunners but he came up with the goods yet again at the Battle of Britannia. He was a bit isolated all game long as his teammates didn’t come up with those telling passes in the final third, but he showed his class yet again when he got on the end of Tomas Rosicky’s lofted cross to level the tie for his side. In this corresponding fixture at the Emirates, he came off the bench to net a brace. As Bruno Mars quoted in his hit song, Count On Me, Arsenal can always count on Robin van Persie like one, two, three – he’ll be there. Aaron Ramsey’s rejuvenated performance at the Britannia. Feel free to share your own lessons learned. Wenger to the Board and Guardiola in? In a somewhat relatively dull start to the weekend, a piece of information rocked the football world like an earthquake with a high magnitude. Despite enjoying a managerial career people could kill for, as well as managing a team that’s best regarded as the best football club in this generation, Barcelona’s Pep Guardiola has decided to call it quits at the end of the season, bringing an end to an glittering career that saw his team amass 13 from a possible 18 trophies making him the Catalans most successful manager. His eulogy was very emotional to say the least, and the looks on the faces of the members of his team were priceless. It sort of reminded me of the looks a little kid gets when the Ice Cream man comes around to say that the supplies are over. You certainly have the option of crying but shedding a tear or two wasn’t going to avert the decision. As expected, the media vultures feasted on this news like vampires seeing a human after days of starvation without blood. The Guardian published a report revealing that the pressure of managing the club gradually ate away into his enjoyment. However, other media Vultures believe that he resigned from Barcelona for a fresh challenge and he’s hugely tipped to make a move to the Premier League, with his potential destination being Arsenal. When the club was going through a rough patch of form that saw the Gunners lose to AC Milan as well as Sunderland in the FA Cup, the Daily Mail reported that he was ready to replace Arsene Wenger at the helm of affairs of the club. Wenger was under intense pressure at that point in the season but he steadied the ship and sailed to a new direction on course to that treasure island called the Third Place. Arsenal’s supremo has stated that he’s surprised to see Guardiola leave his coveted position. Wenger questioned the timing of the announcement as it came in the wake of the club’s Champions League exit in the hands of Chelsea. Barcelona did everything right and played their attractive football over the course of two legs but Chelsea proved that they were certainly no pushovers, no contest is pre-determined and no side is unbeatable. Speaking of timing, we all know how FC Cologne has handled the Lukas Podolski saga, they’ve stalled in announcing his imminent departure because of the potential backlash it was going to cause among the fans but they had to wait till the Spring to make the announcement anyway. Wenger also spoke about Barcelona’s philosophy and the stress levels of the job. The Catalan giants have had this “philosophy” they’ve employed in the yesteryear which involves honing more aliens from their La Masia Mutant Academy as well as delivering the best type of football which resonates around ball possession when on the ball and heavy pressing off the ball. This season, Barcelona unleashed more aliens to the football world in the form of Isaac Cuenca and Tello to a squad that Arsenal has the likes of Lionel Messi, Andres Iniesta, Xavi Hernandez and Cesc Fabregas. Some Gooners want to see Arsene Wenger pushed up to the Board, leaving the manager’s position vacant and they also believe that Guardiola can be the man to stop Arsenal’s Black Widow spider to exit from the Emirates Stadium trophy cabinet after seven years of spinning webs in the cozy piece of furniture. I’m not an Arsene Knows Best (AKB) but there’s no point jumping into the Guardiola bandwagon. Arsene Wenger has proved countless times what his vision, principles and continuity has done for the club but he’s currently going to a barren spell that has been heavily contributed by injuries, suspensions, poor officiating against team, bad luck and of course, his tactical errors from time to time. If Guardiola can leave a trophy-laden club like Barcelona after just four years, do you think that Arsenal will be any different after he wins another six trophies in his first season in charge with the Gunners? He’ll probably say that he’s tired of England’s weather and taxing system, declaring that he wants to manage George Jetson FC, the latest club from Outer Space. For those that don’t know, there’s a new planet in our Solar System, Planet Ramos. Arsenal is sitting pretty in third place but a series of poor results can change the outlook of things in the run-in for Champions League qualification. The Gunners face a stern test away to Stoke, a ground that hasn’t given them much joy in recent times. The Gunners’ form has considerably dropped, from the never ending series of victories to just two wins in the last five outings. 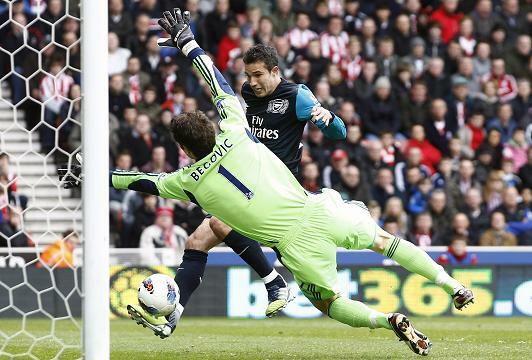 The goals have also dried up for hitman Robin van Persie, that has managed one goal in his last seven games. With Manchester United’s Shrek breathing down on his neck, it’s high time RVP get a goal or two to help him and his team’s cause. His goals will propel him to the Golden Boot while they’ll also play a part in his club’s bid for third place. It’s also worth noting that van Persie has scored 27 league goals while Stoke as a team has amassed 31. Four of the last five meetings been Arsenal and Stoke has surprisingly ended in a 3-1 scoreline. Arsenal has also conceded just five headed goals in the league, which is the joint-fewest in the top flight. However, Arsene Wenger has stated that his team is better equipped for this match. Vermaelen has said that his Guns are ready for the battle of the Brittania. To team news, the absentees (Walcott (hamstring), Arteta (ankle), Mertesacker (ankle), Wilshere (ankle) Frimpong (knee)) are still nursing their injuries but the Arteta jinx has to end pretty soon. Arsenal hasn’t won any game he didn’t play and victories are paramount to secure third place. I expect Wojciech Szczesny to continue in goal with the regular back four of Quickie Gibbsy, the Verminator, Bosscielny and Bac the Man. Yossi Benayoun returns in midfield while Tomas Rosicky has recovered from a sickness; I’ll expect Alex Song, Little Mozart and probably Aaron Ramsey to get the heads up in midfield. This ground won’t bring fond memories for the Welsh captain but I believe that he’ll put his head down and give his usual 110% even though his ability still remains questionable. In this corresponding fixture at the Emirates, he supplied a delicate chip over the defense to Le Forehead, which was dispatched perfectly by the Ivorian. At that point in time, the fans adored Ramsey and sang his songs only to wish him injuries or even worse in the turn of the new year. Please, get off his back. The attack will be without Theo Walcott, so I expect Le Forehead to be drafted back into the squad to play in the forward line with the Ox and van Persie. I won’t watch the match though, I’m gonna be with i.am.OGB utunu and the Cousins of Ciroc. RT @eromzy: Messi misses penalty. Torres scores winning goal in stoppage time. The biggest miracle since Moses parted the Red Sea. “Anti-football” came into the limelight when Chelsea’s Guus Hiddink visited the Nou Camp in the 2009 Champions League semifinals to literally park the bus. They received a mixed reception of praise and criticism for that performance but it didn’t really matter because Andres Iniesta and his alien lot had the last laugh. Chelsea were faced with the same gruelling task of visiting the Nou Camp three years later and the odds were firmly stacked against Roberto di Matteo’s hordes. Despite a valiant yet negative defensive performance, Chelsea had enough in the tank to quell the threat Barcelona posed. Spanish diver-in-chief Sergi Busquets opened the scoring when the defense cracked after some intense pressure and it seemed as if the floodgates were set to open when Iniesta scored a neat finish. However, Ramires the Great Lizard scored a goal Carlos Vela would have been proud of and this was followed by the match clincher by El Flopino. Having just four shots on target and a possession of 18.5 percent over the course of two legs showed how much Barcelona dominated the proceedings. Despite the fact that Spanish football has become accustomed to treating the ball as a friend, games are won by goals. Chelsea’s cause wasn’t helped when the ex-girlfriend shagger earned himself an early bath after an off-the-ball infringement on Alexis Sanchez. For what it’s worth, John Terry won’t be around to slip on the penalty spot to smash an effort off the post. Speaking of penalties, Bayern Munich, the dark horses of this season’s Champions League, had to depend on the lottery of a penalty shootout to end Jose Mourinho’s dream of being the first manager to potentially win the competition with three different teams. Sergio Ramos also became the first player in a long while to launch his shot into orbit in a semifinal. You can’t blame Rafael Nadal’s clone though, the sky is his limit. Both teams will head into the final with their fair share of injuries and of course, suspensions. As stated earlier, Chelsea will be without the football creator of ex-girlfriend shaggernomics, John Terry. They’ll also be without Ramires the Great Lizard, Big Arse Ivanovic and that Portuguese bloke that has more tattoos than the amount of times Lionel Messi checks his mirror to see if his height has increased. Bayern Munich on the other hand, will be without David Alaba Market, who was undoubtedly my Man of the Match yesterday. He picked himself up from the disappointment of conceding an early penalty to put up a stellar performance. The Bavarians will also be without Holger Badstuber and Luis Gustavo. England is permitted to feature only four teams in the Champions League. The fact that Chelsea has a 50 percent chance of winning the competition means that the team that ends up in fourth place has a high chance of playing Europa League football next season. The battle for the final slots of the Champions League is between Arsenal, Newcastle, Tottenham and potential Champions League winners, Chelsea. As an Arsenal fan, the pleasure of seeing Tottenham falter on a weekly basis is certainly not orgasmic, but it has a way of filling you up with smiles and fits of laughter. The most hilarious part of it all is the fact that Twitchy Ol’ ‘Arry and his Spuds actually had plans of…winning the Premier League. Tottenham is won just once in their last nine games but they have the easiest set of fixtures on paper.They are set to play three teams battling to stay afloat relegation waters in the form of Blackburn, Bolton and Wigan and they’ll end their campaign against Everton. Tottenham needs to win all these games to stand a chance of finishing the league in third place. However, the chances of Tottenham ending this campaign as the third best team in the land is as impossible as Gareth Bale going to the zoo without being recognized by his fellow primates. Chelsea have two cup finals to look forward too next month but they are in a pretty precarious league position as far as qualification for the Champions League is concerned. “On the bright side”, the Blues are set to play three of their four remaininf league games at home with the only away trip being the FA Cup final prequel against Liverpool. I certainly have no problem with Chelsea winning the FA Cup because they are still eons behind Arsenal by virtue of trophies won in that competition. I’ll certainly go berserk if they win the Champions League before my beloved Arsenal. Arsenal still remains in pole position to clinch third place but the Gunners have the threat of the resurgent Newcastle to contend with. The chances of Tottenham and Chelsea finishing in third place are slim to none, but they stand a chance of usurping Newcastle in fourth place. I must say that I’ve been hugely impressed by Alan Pardew and his lot. The manager will have a big fight in his hands to keep his key players that have shone like the stars they are. Despite the fact it’s something of a disastrous result for Arsenal fans, I can only offer my congratulations to Chelsea on an extraordinary performance at the Nou Camp. There is a lesson to be learnt there: whilst Chelsea aren’t your traditional underdog, they showed that no side is unbeatable, no contest pre-determined. With the exception of the idiotic John Terry, they were a credit to themselves and the Premier League. Right. Off to wash my mouth out.